Sciency Thoughts: Eruption on Mount Sinabung. 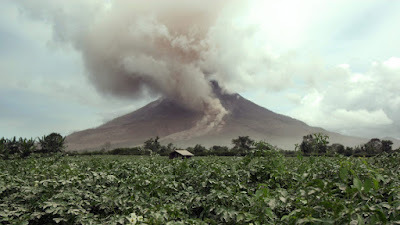 Residents of villages close to Mount Sinabung on North Sumatra have been forced to evacuate their homes following two eruptions on the volcano on Thursday 25 February 2016. The first eruption occured at about 6.45 pm the second slightly after 11.20 pm. Both produced ash columns reaching about 2 km above the summit of the mountain, and threw hot ash and lava up to 500 m from the crater. An ash column over Mount Sinabung on 25 February 2016. Dedi Sahputra/SAPO. Mount Sinabung, a 2460 m stratovolcano (cone shaped volcano made up of layers of ash and lava) in the Karo Regency; it is potentially a very dangerous volcano, as a large number of people live in its immediate vicinity. The last major eruption prior to the twenty-first century happened in about 1600, with small eruptions occurring in 1889 and 1912. However the volcano returned to life in late August 2010, erupting throughout September and causing about 12 000 people to flee their homes. The location of Mount Sinabung. Google Maps. The Indo-Australian Plate, which underlies the Indian Ocean to the west of Sumatra, is being subducted beneath the Sunda Plate, a breakaway part of the Eurasian Plate which underlies Sumatra and neighboring Java, along the Sunda Trench, passing under Sumatra, where friction between the two plates can cause Earthquakes. As the Indo-Australian Plate sinks further into the Earth it is partially melted and some of the melted material rises through the overlying Sunda Plate as magma, fueling the volcanoes of Sumatra. The Subduction zone beneath Sumatra. NASA/Earth Observatory. This does not happen at a 90° angle, as occurs in the subduction zones along the western margins of North and South America, but at a steeply oblique angle. This means that as well as the subduction of the Indo-Australian plate beneath the Sunda, the two plates are also moving past one-another. This causes rifting within the plates, as parts of each plate become stuck to the other, and are dragged along in the opposing plate's direction. 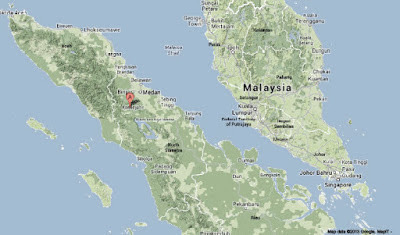 The most obvious example of this is the Sumatran Fault, which runs the length of Sumatra, with the two halves of the island moving independently of one-another. This fault is the cause of most of the quakes on the island, and most of the island's volcanoes lie on it. The movement of the tectonic plates around Sumatra. NASA/Earth Observatory. Thousands evacuated following series of eruptions on Mount Sinabung, Sumatra. Asteroid (457662) 2009 DZ passes the Earth. Deciphering the rings of 10199 Chariklo. Asteroid 2016 DB passes the Earth. Indonesian Pittas on sale in Javan Bird Markets. Asteroid 2016 CG18 passes the Earth. Eruption on Sakurajima volcano, Japan. Asteroid 2016 AK193 passes the Earth. Ethiopia experiences a rain of Fish. Scientists observe eruption on Heard Island. Asteroid (438661) 2008 EP6 passes the Earth.